Mattel is a brand of Mauritano-Tunisienne des Télécommunications. It is the oldest mobile network in Mauritania. At the moment, the operator is the third in the market by the number of connections. 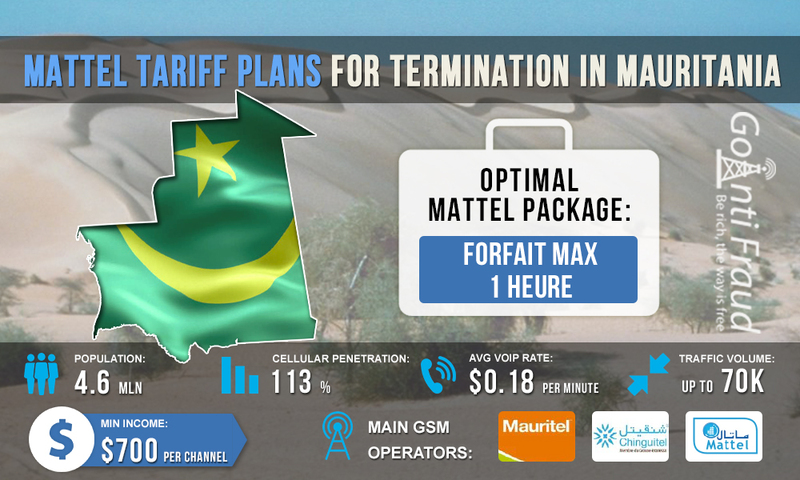 Mattel offers prepaid mobile services on quite favorable terms; SIM cards of this brand can be successfully used to land international voice traffic in Mauritania. 30 min. Provides 30 minutes for calls, the subscription fee is $0.85. 1 heure. Provides 60 minutes for calls, the subscription fee is $1.43. 30 min. The subscriber is provided with 30 minutes for calls, 30 SMS and 30 MB of mobile Internet traffic. The subscription fee is $0.88. 1 heure. The subscriber is provided with 60 minutes for calls, 60 SMS and 60 MB of mobile Internet traffic. The subscription fee is $1.5. FORFAIT MAX 1 HEURE is the most suitable plan for termination. With this plan, one minute of conversation will cost 2 cents. With the voip gsm gateway tg400 running for 60 minutes a day, your earnings will be $70 and more from each equipment channel. The more traffic you land, the higher is your income.